"Throwback" by "Fitkicks" active lifestyle day pack. Water and odor-resistant zippered base great for wet items", sweaty gym clothes or footwear. Fully-lined interior has over 60 liters of storage space. 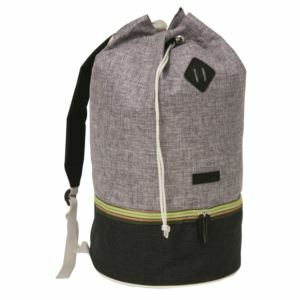 Adjustable strap and cinch-top drawstring closure.